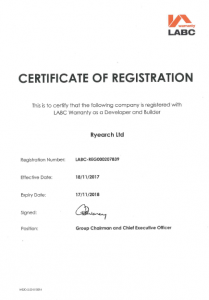 Ryearch is registered with LABC Warranty as a Developer and Builder, which provides clients with further confidence about the high quality of Ryearch’s new build housing developments. LABC Warranty works in partnership with Local Authority Building Control (LABC) and provides structural warranties on new homes. The warranty is designed to protect contractors and property purchasers from structural issues, for a duration of 10 or 12 years. Walkham Meadows Social Housing Development, Horrabridge: construction of 8 new two and three-bedroom houses and 2 one-bedroom flats for Devon & Cornwall Housing (DCH). Project ongoing, due to complete in June 2018 with a contract value of £1,190,000. Southway Social Housing Development, Plymouth: construction of 21 new homes including three two-bed flats, eight two-bed homes and ten three-bed homes, for Westward Housing. Project ongoing, due to complete winter 2018 with contract value of £2,706,000. Parsonage Road Social Housing Development, Newton Ferrers: construction of 16 new build houses in the South Hams for Devon & Cornwall Housing (DCH). Completed May 2017 with contract value of £2,380,000. Tavistock Road Social Housing Development, Derriford: construction of 22 new properties in North Plymouth for Eliot Design & Build and Westward Housing. Completed December 2014 with contract value of £1,910,000. Throughout the contract period, a Site Audit Surveyor works alongside the project’s LABC Surveyor, undertaking site inspections to ensure the development is in accordance with technical standards. Once the build is complete and all conditions satisfied, LABC Warranty issue a Certificate of Insurance for each property within the housing scheme. LABC Warranty policies are underwritten by ‘A’ rated global insurers and are accepted by leading UK mortgage lenders, which can help developers and buyers secure finance more easily. More information about LABC Warranty can be found here.